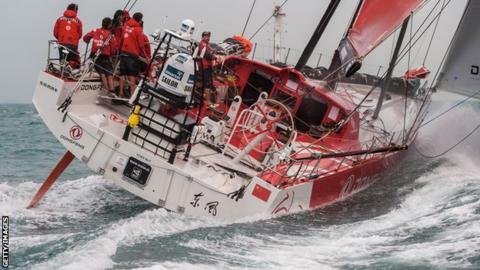 Dongfeng Race Team won the third leg of the Volvo Ocean Race to become the first Chinese stage winners in the event's 41-year history. They arrived at the Chinese island of Hainan 23 days 13 hours and 31 minutes after leaving Abu Dhabi. The team, skippered by Frenchman Charles Caudrelier, lead the overall standings having finished second in the previous two legs. "We had to arrive here first. We're very proud," said Caudrelier. "One year ago we were here just discovering the Chinese rookies, they didn't know anything about this kind of boat, and now they've won a leg." Dongfeng won by about 50 nautical miles with Abu Dhabi Ocean Racing - skippered by Briton Ian Walker - in second, also their overall position. Six teams are left competing after Team Vestas had to be rescued from shark-inhabited waters during the second leg. Leg four of the race, from Hainan to Auckland, New Zealand, starts at 06:00 GMT on 8 February.